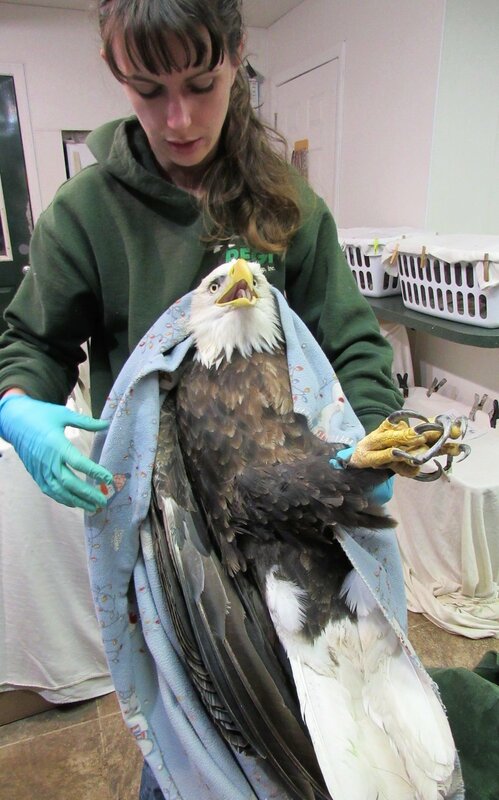 Adult Bald eagle with lead poisoning — Raptor Education Group, Inc. It has been another exhausting day at REGI. We admitted another adult Bald eagle with lead poisoning tonight. Our thanks to Cheri and Benny Bowman for rescuing the eagle from Shawano and transporting it to REGI. He has respiratory distress as well as seizures. He is under treatment at this time. His condition is critical. Another Bald Eagle rescue was attempted late this afternoon however, rescuers ran out of daylight. They will try again in the morning. A Pileated Woodpecker near Shawano and a Dark-eyed Junco near Merrill both hit windows and have head injuries. Thanks to John and Vicki Kuester for rescuing and transporting the junco to REGI. We have new photos taken today of the Keshena Bald Eagle with lead poisoning admitted though Menominee Conservation. She is improving but continues to have breathing issues. We are hopeful. This handsome adult male Bald Eagle was admitted this evening from Shawano, WI. He was rescued and transported by Cheri and Benny Bowman. Cheri and Benny Bowman rescued and transported an adult Bald Eagle from Shawano this evening. 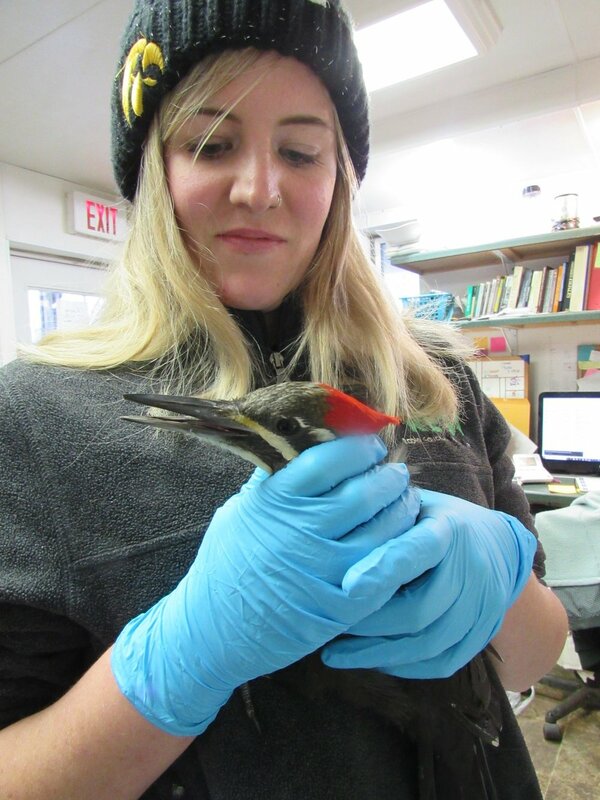 Katie Ibsen cares for a female Pileated Woodpecker that hit a window near Shawano. Thank you John and Vicki Kuester for rescuing and transporting a Dark-eyed Junco that hit a window. Dark-eyed Juncos are sparrow like birds that live and breed in the Boreal forest in Canada. They are winter visitors to our region of the U.S. This is the lovely lady Bald Eagle from Keshena. She is improving but continues to have breathing problems. Stunningly beautiful Keshena female bald eagle. Keshena bald eagle standing and no longer suffering from seizures.